Distribution and habitat: Phoenix canariensis is endemic to the Canary Islands where it occurs in scattered populations of varying sizes on all seven islands, with the largest populations of wild palms being found on La Gomera. It is found from sea-level up to 600 m in a range of habitats, from humid areas just below cloud forest to semi-arid areas where its presence usually indicates groundwater. 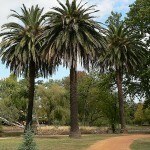 Phoenix canariensis is a large solitary palm, 10 to 20m (33–66 feet) tall, occasionally growing to 40m (131 feet). The leaves are pinnate, 4–6m (13–20 feet) long with 80–100 leaflets on each side of the central rachis. Small, off-white flowers grow on brush-like stalks up to 2m (6 feet) long. Female trees bear a yellow-orange fruit about 2cm (0.8 inch) across that is attractive to birds. The fruit contain a single large seed. The fruit pulp is edible but too thin to be worth eating. 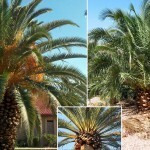 Description: Phoenix canariensis is the hardiness and most popular palm species. It has a husk-like stem consisting of wide, emerald green leaf bases partly covered with brown, fibrous hair. The dark green fronds are finely divided and their stalks are a paler green. The pinnae are quite stiff but not easily damaged. The many pinnae of each frond are all arranged in roughly herringbone fashion, some in opposite pairs, some not. The pinnae (leaflets) vary to a considerable degree in length, shorter ones near the base and tip of the frond and longer ones in the middle. 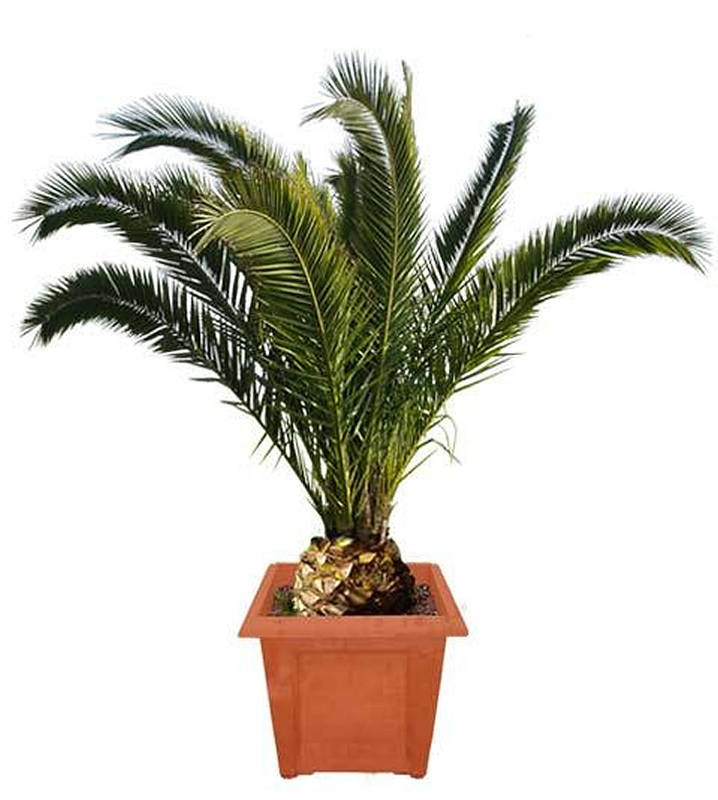 This palm will grow 2m (7 feet) tall, with fronds up to about a metre long, in a small tub. Proper care: The Phoenix canariensis is a real joy to grow and easy to care for, if good drainage and enough light can be provided and they have enough space within a room. It lives for many years and grow slowly, so buy a Phoenix canariensis palm that is already at least 1-1.2m (3-4feet) tall to be able to display it in it is full glory. Light: Phoenix canariensis loves growing in sunlight, but indoors is best to provide it with filtered light. 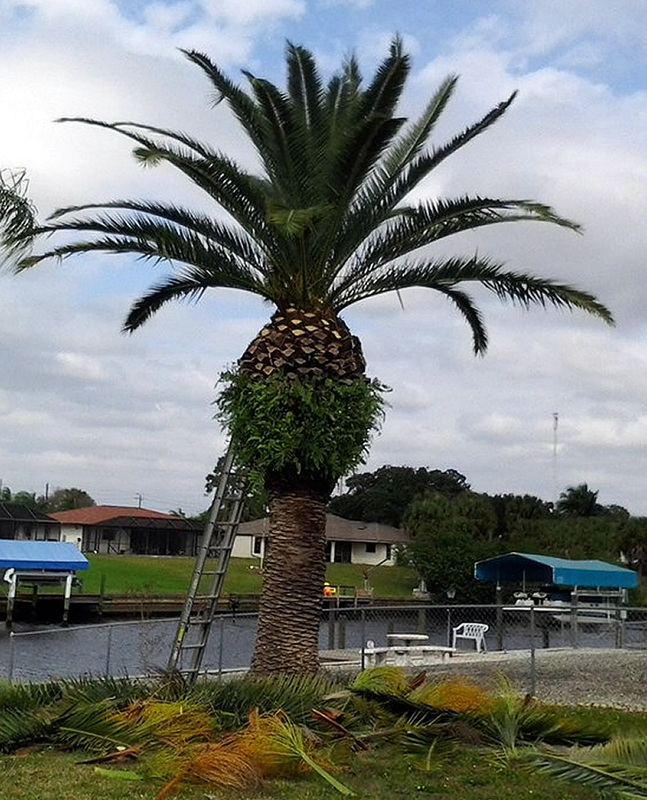 An east or west facing window makes a good spot to place this palm. It is recommended to move these house palms outdoors for the summer months in a place where they can get some indirect sun light. 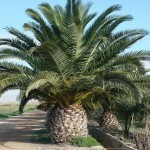 Temperature: Average room temperatures of 16 to 24°C (65- 75°F) are suitable for growing these palms. They do best if they are encouraged to have a winter rest period at about 10-13°C (50-55°F). Avoid cold drafts. Average room humidity is fine. To improve humidity mist the leaves during the summer (if air becomes dry) and when air is dry from artificial heating. Watering: Avoid over-watering and provide good drainage for Phoenix canariensis palms. Allow the potting mixture to become slightly dry at the top and then water. Water sparingly, making the mixture barely moist during the rest period. As winter approaches, begin to reduce amounts of water gradually. When active growth begins, increase amounts of water gradually. Feeding: Use a specifically design fertiliser for palms because they are very sensitive to being over fed and need the right balance of nutrients suitable for them. Keep in mind that is better to under feed than over feed palms. Over feeding causes more serious problems. Potting and repotting: Phoenix canariensis need to be repotted when it has become pot bound. Repot these palms in pots 5cm (2 inch) larger every two or three years just as new growth starts in spring. Use a peat based potting mixture with good drainage. Two parts peat and one perlite or sand makes a good potting mixture for these palms. Fine pine bark works well within a potting mixture too. When repotting, it is essential to pack the mixture down firmly, but carefully not to damage the thicker roots. Pots from 25-30cm (10-12 inch) are big enough for a metre (3 feet) or so tall specimen; small tubs should be used for larger ones. Once the maximum container size has been reached, every year top dress with a few centimetres (1 inch) of fresh potting mixture. Then every four years the potting mixture can be completely renewed. Check the root systems size and health. Roots may need pruning. Gardening: Within the limits of its hardiness (down to about -10°C) Phoenix canariensis is adapted to more habitats and soils than almost any other palm. This, combined with its relative hardiness to cold, make it one of the most widely-planted palms in the world. Growers sometimes prune the massive trunk and its sheath of fronds to resemble a pineapple, reason for the one of its common names. It is a slow growing palm. In ideal conditions, seedlings grow pinnate leaves within about a year from sprouting and increase to full width in about 5 years, at which point they begin to form a trunk. They can then put on about 30cm (12 inch) trunk height growth a year, though they are usually much slower, particularly when young. 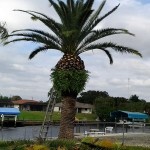 It will require pruning to remove old fronds. Only prune fronds which hang below the horizontal. 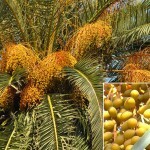 Do not remove those growing upright since this may slow the growth and reduce the palm vigor. This palm has spines and sharp edges; use extreme caution when handling. Position: While best in full sun Phoenix canariensis can tolerate a wide range of exposures, including deep shade. It should be grown in full sun on fertile for best growth. It can be planted on the inland side of coastal condominiums and large homes due to moderately high salt-tolerance. Soil: Phoenix canariensis prefers well-drained loamy soil, but will tolerate a wide range of soil types, including sand and heavy clay. Irrigation: It has a unique ability to tolerate both severe drought and flooding very well, which makes them ideal to plant in housing tracts in which the soil was heavily compacted. Water young plants for healthy look and fastest growth. Fertiliser: Older leaves frequently become chlorotic from magnesium or potassium-deficiency. Preventive applications of appropriate fertiliser helps avoid this. 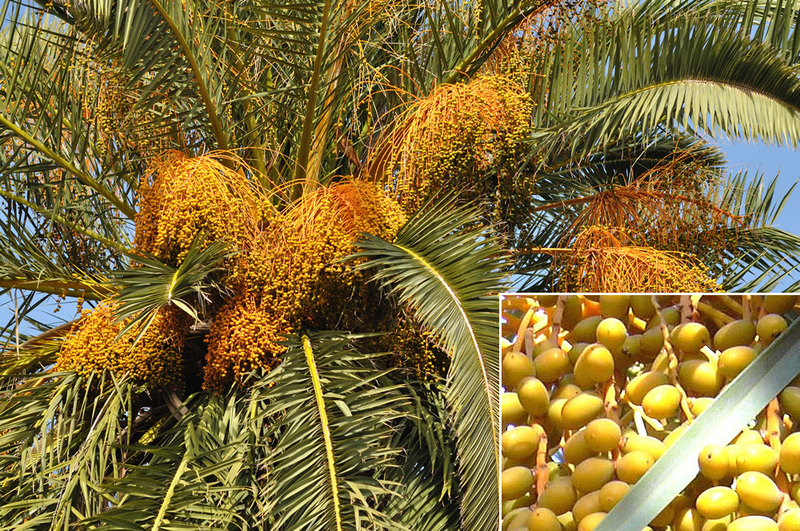 Use a special designed palm fertiliser for right balance of nutrients suitable for them. Do not over-fertilise the palms. Propagation: Commercially, Phoenix canariensis palms are raised from seed. This is a slow process (they take about 3 months to germinate), however, and is not recommended for amateur growers. Some gardeners plant date stones. The stones germinate easily in spring if they are placed in a warm position and kept moist, but the first leaf is a single undivided section, and it may take two or three years for leaves with divisions to appear. Set the stones individually in 8cm (3 inch) pots or start those in seed boxes. In the latter case, pot in 8cm (3 inch) pots after they have germinated and have made about 5-8cm (2-3 inch) of growth. Thereafter their cultivation needs will be those of mature Phoenix canariensis palms. 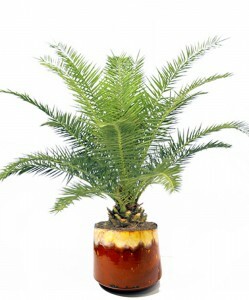 If sucker shoots at the base of Phoenix canariensis are carefully detached, they should have some roots already formed, and such shoots can be used for propagation. Pot each shoot in an 8cm (3 inch) pot of the standard potting mixture, place it in bright filtered light and water it sparingly-just enough to keep the mixture barely moist. After new top growth indicates that the shoot is well rooted, treat the young plant in the same way as a mature Phoenix canariensis palm. May be attacked by glasshouse red spider mite, thrips, mealybugs and scale insects. 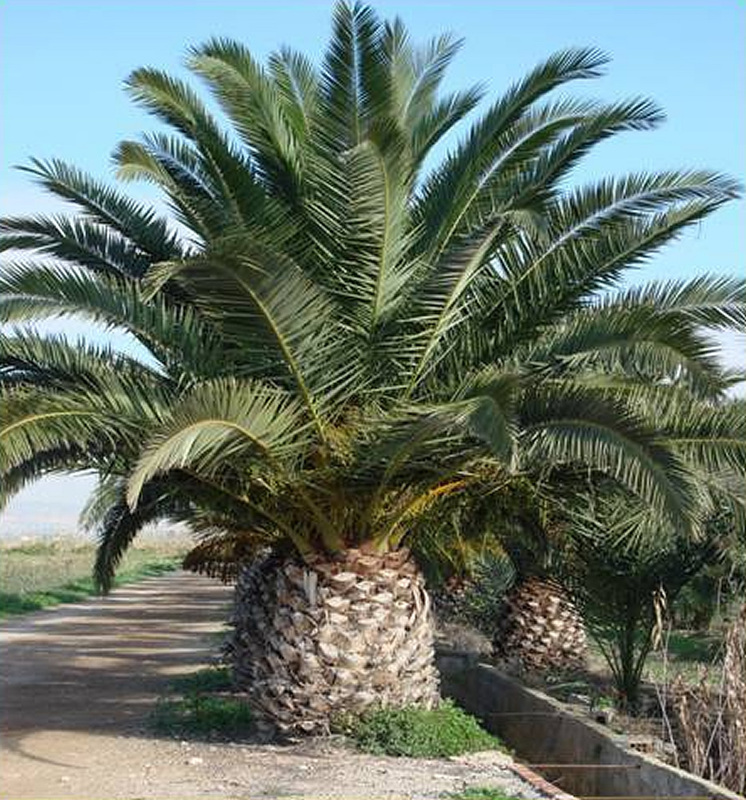 Availability: Phoenix canariensis are generally available in many areas within its hardiness range. Note: Do not place young Phoenix canariensis palms too close to walkways where their sharp leaf spines might injure passersby. 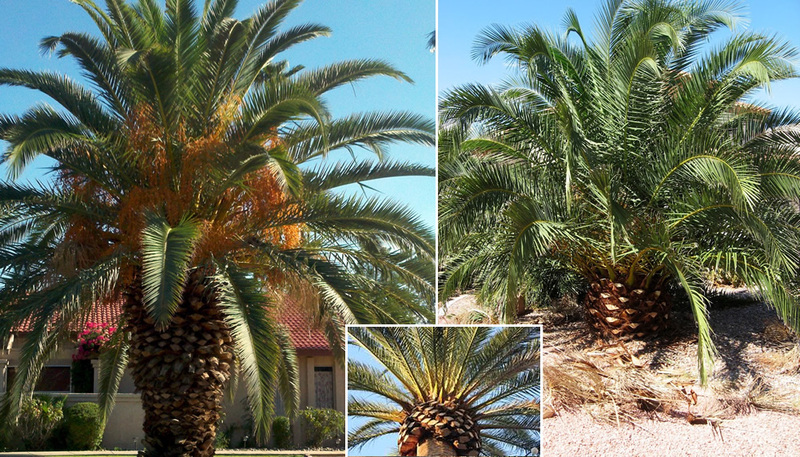 In some Mediterranean and subtropical countries, Phoenix canariensis has proven to be an invasive plant. 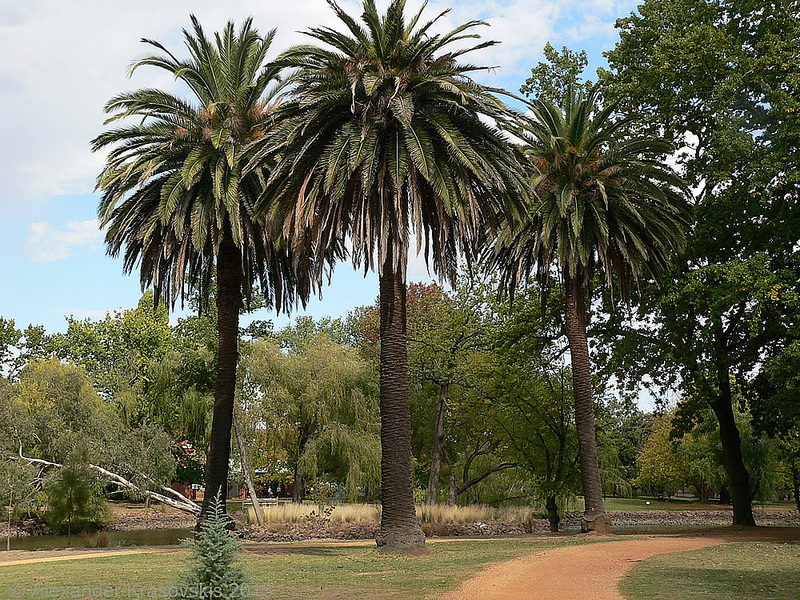 Uses and display: Phoenix canariensis is too large for most residential gardens but it is sometimes planted in parks and along streets. For a dramatic statement use this huge imposing palm wherever there is space to accommodate it. This majestic palm it is suitable for xeriscaping. Small specimens make great container plants – they look especially nice in large terra cotta pots. In colder regions they can be over-wintered indoors in a cool bright location. Small specimens are inexpensive and readily available and look great in pots on the patio, near the pool or in pairs flanking entryways.